We would like to thank our customers for all the support you have given us over the five years we have been running Mr Coaster and for the many years before that at Toyhatsu Wrecking. The Mallon family have sold Mr Coaster and wish the new owners Barbara and Robbie all the best, we are sure you will continue to receive the same great service and advice and we hope you continue to support them as they learn about the business. Mr Coaster specialises in New, Used and Reconditioned Parts for Toyota Coaster Buses. �We supply Genuine Toyota parts as well as new aftermarket parts. Our stock includes mechanical, electrical, exterior and interior parts as well as accessories for all Toyota Coaster bus models. Browse a small selection of our Toyota Coaster parts in our online store or view the Toyota Coaster Buses we are currently wrecking. 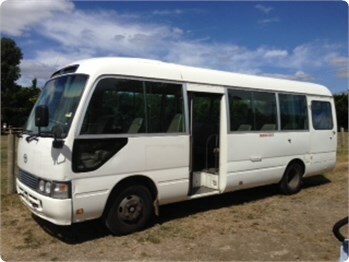 Please contact uswith your Toyota Coaster�parts�request if you have questions, want to place an order or you don�t find what you are looking for. We arrange delivery anywhere in Australia or Internationally. Your parts can be delivered directly to your home, a workshop or to a caravan park or post office if you are on the road. All our freight, national and international has online tracking so you are able to check up on the progress of your item. Most importantly, we offer a warranty you can trust. We are always happy to hear feedback about our parts and/or service as we want customers who are happy to return and pass our name along to others.